If Im So Wonderful, Why Am I Still Single? Title: If Im So Wonderful, Why Am I Still Single? Description: If You Want to Find Your Soul Mate, You First Have to Know Yourself. If Im So Wonderful, Why Am I Still Single? 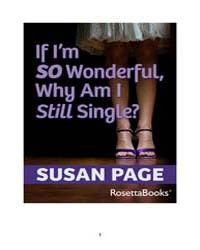 Offers Intelligent, Practical, and Engaging Guidance to Singles Looking to Improve Their Romantic Relationships--By Getting to Know Their Own Past Patterns and Relationship Needs. Guided at Every Step By Pages 10 Strategies for Better Self-Knowledge, Readers Will Find Quizzes, Case Studies, and Anecdotes From the Authors Decades of Experience As a Counselor to Both Couples and Singles. Each Aspect of the Book is Tailored to Help Readers Figure Out What They Really Want--And Learn Not to Settle for Less. If Im So Wonderful, Why Am I Still Single? Has Been Translated Into 22 Different Languages, and This Year Celebrates the 25Th Anniversary of Its Debut. Offering Advice Thats Positive, Compassionate, and Effective, This Book Will Help Readers Understand Their Own Romantic Motivations and Find the Partner Theyre Looking For.